Background and Purpose: Turkish hazel (Corylus colurna L.) has been overused because of its valuable wood. Recently, Turkish hazel has been found only in small isolated populations, and very small populations within its natural distribution area, so it has been protected under IUCN with the status "Least Concern (LC)". Therefore, the remaining Turkish hazel populations have a critical importance. Genetic conservation of this tree species plays a key role in sustainable forest development. There have been only a few studies of single populations, but an overview including all countries is still missing. The aim of this publication is to give an overview of ecological and economic importance of Turkish hazel, which is considered as a tolerant tree species to climate change, for dry and warm conditions in Central Europe. Materials and Methods: This review paper has been prepared based on the existing literature such as reports, theses, project documents and publications related to Turkish hazel. This paper applies a literature review of the concepts of: i) Distribution and threats of Turkish hazel, ii) Ecological and economic importance, iii) Regeneration, soil demand and shading tolerance, iv) Seed, seedling, plant production and planting, v) Competitiveness in forest communities, vi) Invasiveness and hybridization, and vii) Future stand mixtures. Results and Conclusions: This review paper should interest forest practitioners and scientists in all countries who work with this important and valuable tree species under climate change. At first, an inventory of all populations in each country is needed. For this purpose, research should focus on the cultivation of convenient provenances of Turkish hazel under climate change. Next, genetic differences should be determined in the laboratory using genetic markers. After the assessment of the phenotype and genotype of different provenances, it would be possible to recommend provenance for each ecological condition and assisted migration (AM). Main recommendations for each country are used for selecting and establishing gene conservation units (in-situ and ex-situ) and seed orchards that will ensure the survival of Turkish hazel, and for building the base for cultivation in the future. In addition, the results might be a basis for future provenance tests, plantations and possibilities of assisted migration attempts. Climate change affects all forest ecosystems, as well as services and goods provided by forests. A possible and suitable adaptation strategy to stabilize forest stands is usually provided by establishing mixed forests. By improving the existing spectrum of tree species in Central Europe, the risk can be minimized. The origin of the reproductive material of a tree species plays a key role in its adaptation to environmental conditions, and possible cultivation. Turkish hazel (Corylus colurna L.) has been currently discussed as a valuable alternative in Europe . Turkish hazel has been overused because of its valuable wood , which is why it is now found only in isolated and very small populations within its natural distribution area . Turkish hazel is a protected species according to the IUCN list . Therefore, the remaining Turkish hazel populations have a critical importance. These populations can be used as a natural reservoir for seed collection. These trees are already well-adapted to difficult environmental conditions . In countries where this species occurs naturally, the required propagation material should not be imported, and plant materials should be grown in these areas. Turkish hazel is a semi-shade tolerant tree species that can create mixed stands with other species, and has a low invasion potential. This tree species has many characteristics such as high resistance to abiotic and biotic damage, less expectation of soil fertility, drought tolerance, winter and late frost resistance, which can contribute to the stabilization of forest stands. In its natural distribution area (i.e. the Balkan Peninsula, northern Turkey, Caucasus and Afghanistan), Turkish hazel grows mainly on shallow, low-nutrient and dry lime soils, but it can also grow in locations which include lime and silicate rock. The average annual temperature in the area of origin varies between 5 and 13°C, while the annual participation ranges from 570 to 800 mm . The natural spread extends northwards to Romania in Vâlcan Mountains (Tismana), and in north-west to Bosnia and Herzegovina (Konjic) [6, 7]. The import of Turkish hazel to Central Europe started in the 17th century. Since then, it has been cultivated to a very small extent in Italy, Austria, Germany, Poland, Ukraine, and Hungary. In many countries of Central Europe, Turkish hazel is only known as a garden and park tree. Even in the origin countries, the distribution of Turkish hazel is rather rare. The aim of this review is to give an overview of the ecological and economic importance of Turkish hazel, which is considered as an important tree species in changing climate conditions. A basis for future provenance tests and assisted migration, plantation in Europe and genetic conservation of this valuable tree species in its natural distribution area are also aimed. Recently, there have been only studies of single populations, which means that a comprehensive overview is missing. The Turkish hazel belongs to the birch family (Betulaceae), which has Corylaceae as the subfamily with four genera. The hazel (Corylus) genus contains at least 12 species classified in the temperate zones of Eurasia and North America [8-10]. The Turkish hazel is a member of the Europe-Siberia flora region , and it is a taxon gene-originated from Turkey . It is known as "tree hazelnut", "rock hazelnut", "Balkan hazelnut", "bear hazelnut", "filbert" and "Turkish hazelnut" in literature [3, 12]. Within the species, four aspects including leaf shape, bark structure, hairiness of the petioles and fruit cups differentiate Corylus colurna. For example: f. Rotundifolia has rounded leaves with blunt tips, while f. Cuspidata has elongated leaves with pointed and slightly curved apex. Leaf handle and fruit bowl of f. Colurna are bald, and of f. Glandulifera are finely gorged hairy . In contrast to the common hazelnut (Corylus avellana L.), Turkish hazel can reach heights of 25 to 30 m, and diameter at breast height (DBH) of 50 to 60 cm, while in exceptional cases it can reach a DBH up to 170 cm and an age of 400 years depending on the location [2, 5, 10, 13, 14]. The crown appears pyramidal in youth and usually assumes a dull-conical crown in older ages. The nuts ripen in 5 to 6 pods are surrounded by deeply divided lobes. The edible fruits are 17-20 mm in length and smaller than those of C. avellana. The leaves are slightly larger and darker green, and the bark is greyer than that of the hazelnut. Between Turkish hazel and common hazelnut, hybrids of species can be formed [5, 15, 16]. The natural distribution area of the Turkish hazel includes the regions of Asia Minor, the Caucasus, Afghanistan, and the Balkan Peninsula. Its occurrence on the Balkans covers Bosnia and Herzegovina, Romania, Bulgaria, Serbia, Macedonia, Kosovo, Montenegro, Albania, and Greece (Figure 1). In these regions, it can grow at altitudes between 100 and 1300 m, but it is mainly found between 300 and 800 m. Turkish hazel is mainly distributed in the southern Carpathians of Romania, in Bulgaria on the Balkan Range, Sredna Gora, Rhodope Mountains and in the western and north-eastern forest stands. In Greece, it grows in the Pindus Mountains and in Turkey, the populations, even if relatively marginal from the geographic point of view, find optimal ecological conditions (Table 1) also in the Northern Anatolian forests, where the local range is relatively extended in the North Anatolian Mountains [3, 5, 17-20]. Although the continental climate is ideal for its growth, there is also some occurrence in the Mediterranean climate. The species is resistant to drought, and it mostly occurs on sunny slopes. FIGURE 1. Natural distribution area of Corylus colurna from Alexandrov  and adapted by Šeho et al. . Black dot: individual populations; yellow circle: sample area. TABLE 1. Populations of Turkish hazel (C. colurna L.), which are investigated in the context of the CorCed (www.asp.bayern.de) research project. In Caucasia, Turkish hazel can be founded mainly in oak and beech forests at altitudes of 600-1700 m above sea level (e.g. the Racha region), but its occurrence focuses in Georgia. In Armenia, its distribution is very rare. There is a 120-150 years old Turkish hazel reservation at 1400-1600 m above sea level (near Getahovit) with DBH over 1 m [5, 13]. In Bosnia and Herzegovina, Turkish hazel creates the north-west border of its natural distribution area. In Serbia, there are over 25 populations presented. In former Yugoslavia, this tree species had been protected for over 40 years . Formerly, populations were found in the Hyrcan and Turan regions of northern Iran ; however, there are currently no Turkish hazel populations recorded in Iran. Because of its valuable wood, many tree populations in their natural distribution area have been exploited . From the end of the 16th century through 1850, large quantities of Turkish hazel wood were transported to Austria for furniture manufacturing. After yew wood, Turkish hazel was the second most popular and precious timber in Vienna. Due to the exploitation of Turkish hazel, the original distribution area of the species considerably declined, and vast areas of the natural range are nowadays karst areas . For this reason, Turkish hazel has been included in the IUCN Red List (entry 2014) with the status "least concern" . The climate of the main distribution area of Turkish hazel in Eastern Europe to Asia Minor (Ukraine to the Black Sea, the Caspian Sea to the Caucasus) is continental with high amount of precipitation at relatively higher altitudes . In suitable conditions where Turkish hazel naturally grows, the species is described as a warm-embrace tree species that prefers warmer and sun-exposed slopes. For the maturation of nuts, it needs warmer sites with longer sunshine periods and a longer growing season [10, 23]. Turkish hazel generally has very high resistance to abiotic and biotic agents, and it can survive under short-term temperature extremes of -38.2°C to +40°C . Palashevand Nikolov  state that Turkish hazel range is generally between the altitudes of 100 and 1400 m. However, because of frost hardiness, some populations of the species can grow in altitudes of up to 1700 m above sea level, but they cannot tolerate cold air accumulation . According to the winter hardiness zone classified for Central Europe for trees, C. colurna belongs to winter hardiness zone "5b", being frost-hard and cultivable at -23.4°C to -26.0°C . It is known to be a winter-hard tree species in Central Europe and Southern Scandinavia. According to results from the forestry research station Mariunolskaya (former USSR), winter hardiness and drought resistance are not valid for the first years . The annual average temperatures range from +5°C to +10°C (on the Balkan Peninsula they fluctuate between 5-6°C and 12-13°C), while the annual precipitation ranges from 570 to 850 mm, which falls mostly in the summer . The cover leaf can survive temperatures below -16°C to -18°C, but pollen inoculation is lost at and below -20°C. While mature pollutants can overcome -26°C without change, germinating pollen is damaged at -10°C to -14°C . It is not endangered by late frosts in May and June, as it is usually expelled at the end of March. If frost occurs at this time (i.e. during March), Turkish hazel can be damaged. However, new shoots can overcome the damage. Turkish hazel also shows damage from early frost [5, 14, 26]. It has extreme frost hardiness, drought resistance, and resistance against early drought in August with leaf shedding, thick cork, and an insensitivity to solar radiation . In addition, its very strong branching strength resists snow break hazards [10, 30]. Furthermore, it is able to endure floods of up to three months . The species is also considered to be appropriate to plant in agricultural lands which are stable to drought [27, 28], abstemious according to ground claim [24, 29], and used specially to rehabilitate drought lands. It is tolerant to air pollution, and it can also be planted to protect and stabilize soils. It has been found that Turkish hazel can resist low temperatures such as -20oC, high temperatures and drought, as well as harmful gas emission . Palashev and Nikolov  state that Turkish hazel needs a minimum of 500 mm annual precipitations, and an annual average temperatures ranging between 5oC and 13oC. Turkish hazel can be attacked by all types of wild animals, with the exception of the wild boar, and is often sept by roebucks. In particular, young Turkish hazels are heavily consumed by rabbits [10, 30]. Harmful insects do not present a serious threat for Turkish hazel. However, it can be assumed that insects that occur in the common hazelnut can also attack C. colurna . As a rule, Turkish hazel which grows in mixed stands can be classified as relatively insensitive to biotic and abiotic risks, and therefore it can contribute to the stabilization of forest stands. Turkish hazel has low demands on soil fertility and wide regional amplitude. In better locations, its competitiveness is weak in comparison to other tree species (tolerant tree species) which have relatively higher growth rates. It grows on a wide range of sites: from flat to deep, dry to almost wet, nutrient-poor to nutrient-rich sites. Due to the formation of a strong, 3-4 m deep pile root, Turkish hazel is able to populate on skeleton-rich soil, poor, crooked and stony, and very shallow sites [5, 16]. According to Alexandrov , it has optimal growth conditions in shady, humid locations, within beech and hornbeam forests on nutrient-rich, fresh to semi-dry soils. It grows best on clay, loamy or humid sands soils with sufficient moisture [10, 16]. It prefers nitrogen-poor sites, and has a high demand on the base availability. The optimum pH range is between 5.5 and 8, which means that acidic soils are possible but not optimal [23, 31]. With increasing moisture and nutrient content, it loses its competitive ability to mesophilic tree species, but its competitive capacity increases again in dry and poor locations . Turkish hazel is most common at warm and dry sites within its natural distribution areas. Dry sites dominated by Turkish hazel can consist of medium to coarse debris, gravel or gravel with grain size over 2 mm in the root area [10, 23]. Rather, wet sites throughout the year, as well as very dry sites are unsuitable [5, 23]. However, extremely dry sites are not excluded as locations. Thus, it grows on very dry karst locations with low usable field capacity and partly lacking summer precipitation in the Romanian Carpathians . Turkish hazel is sensitive to soil compaction . It is only conditionally resistant to salinized soil, and is rarely found on raw or peat soil [23, 25]. Mature trees can develop lateral roots. These lateral roots can reach a length of 15-18 m, and usually extend beyond the crown projection area . The root system promotes high stability in stands so that it is particularly suitable for wind protection systems and forest edge design. Leaf litter is well decomposable and has a soil-improving effect, especially in mixtures with hornbeam. Because of its robust root system, Turkish hazel is suitable for erosion protection. Moreover, its roots symbiose with fungi and bacteria . Turkish hazel is usually found in beech stands at higher altitudes, as well as in oak stands at lower altitudes. This tree species can often be found growing as individual trees, as well as in groups, or a cluster in association with beech (Fagus sylvatica L.), Oriental beech (F. orientalis Lipsky), hornbeam (Carpinus betulus L.), Oriental hornbeam (C. orientalis Miller), sessile oak (Quercus petraea (Matt.) Liebl), Hungarian oak (Q. frainetto Ten. ), common ash (Fraxinus excelsior L.), manna ash (F. ornus L.), mountain maple (Acer pseudoplatanus L.), Norway maple (A. platanoides L.) and silver linden (Tilia tomentosa Moench). Turkish hazel does not constitute pure stands . In Bulgaria, almost 50% of Turkish hazel populations are found in stands dominated by Fagus and Carpinus species [5, 32]. Turkish hazel can also be found in beech and oak forests as a rare mixed tree species in the Caucasus area . This tree species occurs in stands composed of, for example, Quercus frainetto Ten., Fraxinus ornus L., Carpinus orientalis Miller, and Crataegus L. in dry and poor locations . On the south-western edge of the Carpathians, it exists in mixed lime-beech forests . The relatively heavy nuts fall very close to the parent tree, and are mainly spread by wildlife animals. Vegetative propagation is rather rare. Vegetation-free or raw floor sites offer favourable conditions for germination . In the case of first reforestation, losses should be expected. Most of the fruits are consumed by wildlife animals. Turkish hazel is considered a semi-shade tolerant tree species and is, therefore, suitable for cultivation on open spaces and in semi-shade conditions. In critical locations, it reacts like a shade-intolerant tree species. Even in semi-shade conditions, it exhibits straight stem forms. Young growth especially tolerates dense canopy . The tree species is robust against lateral pressure, and it does not behave phototropicly. Side branches are preserved for a long time and contribute to photosynthesis . Turkish hazel is considered as a non-invasive species, and is not listed among the invasive species in Germany . Due to its low competitiveness, it is excluded mainly from European beech stands at better site conditions. Natural hybridizations with other Corylus species are possible, but not quite usual. Erdogan and Mehlenbacher  described clusters of 20% between Corylus colurna x C. avellana set when C. avellana was the pollen parent, but 92% of the nuts were empty. The reciprocal cross, C. avellana x C. colurna, set nuts in only one of three years during the studies. Turkish hazel can also provide different phenotypes such as different leaf shapes, hairs of leaf stalks and fruit pots, which complicate its identification. The first genetic differences should be determined in the laboratory using genetic markers . Turkish hazel can supplement an existing spectrum of tree species, and can be mixed in stands as a single tree or in groups. It is especially suitable when mixed with beech, grape oak, pointed acorn, mountain ash, hornbeam or linden, as well as chestnut and Hungarian oak. Experiments conducted in mixture with bird cherry in a 5x1.5 m band and winter line (5x2.5 m) showed that mixing accelerated natural branch pruning in spite of strong competition. The results of an experiment in southern Germany indicated that Turkish hazel can also be used for advance planting under spruce and pine . Turkish hazel can, however, be planted in open spaces (2x2 m) or in wide areas (5x5 m, 7x7 m). It is recommended that seedlings be protected from wildlife and mice in the first years after planting [2, 14]. Turkish hazel can reach an age of 400 years, heights of more than 30 m and a DBH greater than 170 cm . The growth performance on nutrient-rich, fresh soils is roughly comparable to the hornbeam, and almost reaches the growth capacity of mountain maple, common ash and sessile oak. On flat, nutrient-poor and dry lime soils, it shows even a double growth rate compared to other secondary tree species (e.g. Carpinus orientalis) . Turkish hazel is clearly superior to beech in I. site quality class at age 65 in terms of growth performance. Annual ring studies of rootstocks of Turkish hazel and beech with a diameter of 60 cm have shown that, under the same condition, the radial growth of beech was achieved by Turkish hazel at the age of 100 years . The previous experiences in Germany and Austria substantiate the good height-growth performance of Turkish hazel [14, 26]. The annual height growth during a southern German cultivation trial in a productive site (i.e. vineyard area on fine clay soil) was between 75 and 87 cm (max. 140 cm). The average height of the 6-year-old plants was 4.3 m. At the age of 16, heights of 14 m were reached (Figure 2), proving that Turkish hazel grows faster than the neighbouring wild cherry . FIGURE 2. 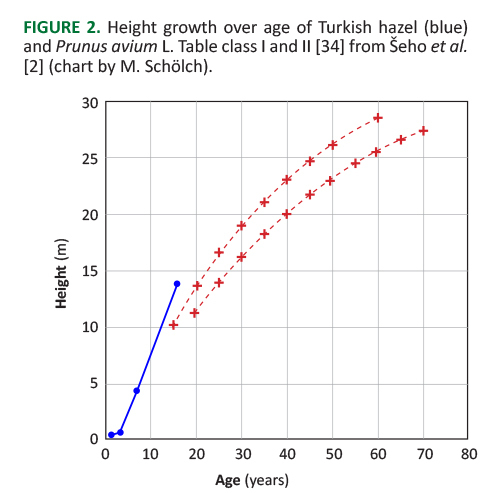 Height growth over age of Turkish hazel (blue) and Prunus avium L. Table class I and II  from Šeho et al. (chart by M. Schölch). Arslan  and Ghimeey  state that Turkish hazel is a valuable reserve tree species in Hungary, and it is considered as a fast growing species. For the reasons stated above, it is also selected as a valuable rootstock source . Turkish hazel tree grows predominantly straight, and develops full-timbered stems. Its characteristic crown is especially prominent in the youth phase. Like many species of laurel trees, self-pruning of Turkish hazel easily occurs up to a height of 6–8 m [5, 37]. In stands with low density, Turkish hazel can produce high-quality wood. In the event of a strong breeding, individual secondary branches may occur. Logging is carried out according to objectives. Due to its dark colour, its wood is regarded as decorative, and is used for furniture and turnery. On submission, prices range from € 300 to € 650 per cubic meter [2, 37]. Turkish hazel was first cultivated as a mixed tree species for scientific purposes about 20 years ago in Central Europe. However, the results of observations on provenance and precise recommendations of origins have not been given. In general, less is known about the history of older cultivations. According to the results of first visited countries of origin, we observed that individual locations differ greatly in their growth and qualitative characteristics . Therefore, it is essential that the establishment of provenance tests and the evaluation of the cultivation should be taken into consideration. A genetic characterization of the material should be carried out [32, 33]. According to a research conducted in Austria, the mean height during 10 years was 7.5 m, while the mean DBH was 6.8 cm . The height growth of Turkish hazel in its natural area of distribution is decisively dependent on site conditions. In an open area, as well as in semi-shade and shadow stand conditions, Turkish hazel exhibit straight growth. Double-topped trees (Zwiesel) that may be caused genetically can be observed. The crown form can be optimised by different forest management treatments. Un-thinned stands show lower diameter growth. The thinning methods should be examined. Current experiences from the natural distribution area show that Turkish hazel should be maintained by positive selection. It can be treated as part of hardwood tree stands . In soil and environmental conditions with lower growth capacity, Turkish hazel can easily cope with mixed tree species including sycamore maple and ash, which occur there and reach similar heights. Due to the low population size, investigations have not been carried out on the overall growth performance. However, Turkish hazel shows a long-lasting diameter growth. According to Ghimeey , Turkish hazel can be overgrown by beech in diameter growth at the same sites after reaching the age of 100 years. The wood of Turkish hazel is characteristic and decorative; in each case, about 50% of the cross-section in yellowish-reddish sapwood and reddish-brown heartwood are monitored. The technological characteristics are characterized by an elastic, medium-hard, scattered pore-like wood, similar to the characteristics of sycamore maple. Its wood is easy to process, but it tends to shrink during rapid drying. Bulk density is about 0.61 g·cm-³ . It was formerly known as "Turkish nut" or "rosewood", and was commonly used for producing excellent furniture manufacturing . It can be used as construction timber (inside and outside), and for carving and turning as well. The reddish colour of the wood is unique. The production of valuable wood of Turkish hazel in good growing conditions can be faster than that of oak . The occurrence of ingrowing branches and callus form may be disadvantageous. According to Zeidler , the wood is mainly used in furniture industry and in production of decorative veneers and cabinetry. The trees fructify by the age of 10, and continue every 2 to 4 years. Nuts should be harvested before full maturity from August to October, and green fruit pods should be removed [10, 16, 25]. One hectolitre of nuts without fruit pellets weighs 43 to 50 kg . One kilogram of seed contains about 600 nuts [10, 25]. The average germination percentage is 40 to 75% . Germination capability can last up to 1 ½ years . The current supply of seeds from Turkish hazel in Central Europe is mainly covered by the cultivation of park and street trees. The number of parent trees and their genetic status plays a crucial role for adaptability, growth, and quality. It is not advisable to use this seed for the cultivation of forestry plants. The risk of inbred effects and genetic narrowing is very high. Individual contacts with seed farmers in the countries of origin have already existed, and should be further developed for future seed supply. It is recommended to use only seeds from natural populations . Nut characteristics of Turkish hazel which are beginning to gain commercial value have started to create additional income. Ayan et al. carried out a research on Turkish hazel pomological features. 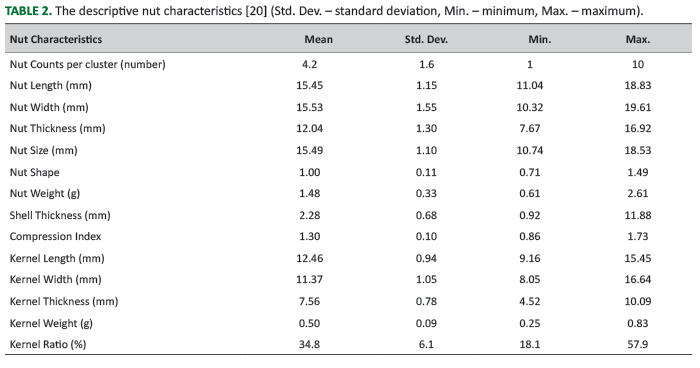 Table 2 shows the descriptive statistics of 14 different nut characteristics of randomly selected cluster and nut samples from four different populations of this species. The nut per cluster ratio was between 1 and 10, the kernel ratio was between 18.1 and 57.9%, while nut weight was between 0.61 and 2.61 g. Erdoğan and Aygün  examined nut characteristics and fatty acids composition of C. colurna, and found that shell thickness was between 0.67 and 3.69 mm, nut weight varied between 1.33 and 2.91 g, while the kernel ratio was between 25 and 36%. In another study, Mitrovic et al. monitored Turkish hazel in Serbia, and found that nut weight was between 1.20 and 2.59 g, kernel weight between 0.38 and 0.74 g, kernel ratio between 29 and 40.1%, and shell thickness between 1.0 and 1.3 mm. In addition, Srivastava et al. found the following values for C. colurna: nut count was 2.83-3.53, nut weight 1.29-1.75 g, kernel weight 0.47-0.53 g, kernel ratio 28-41%, nut length 16.28-18.13 mm, nut width 16.36-17.88 mm, and nut thickness 11.67-12.54 mm. Moreover, Miletic et al. found the following average values of C. colurna: nut coarseness was 16.3x14.0x11.0 mm, kernel coarseness was 13.9x9.7x6.5 mm, nut weight was 1.00-1.75 g, and kernel weight was 0.3-0.65 g.
TABLE 2. The descriptive nut characteristics  (Std. Dev. – standard deviation, Min. – minimum, Max. – maximum). According to Ayan et al. , significant differences were found among populations in terms of protein content, while there were no significant differences in terms of fat content. The fat content of the Turkish hazel populations ranged from 59.85% to 64.07%, while protein content varied from 14.80% to 18.34% at population-based scale (Table 3). Many studies have reported that the nut compositions of hazel are affected by variety, harvest year, soil, climate and method of cultivation [44-46]. TABLE 3. Basic statistics of fat and protein values  (Std. Dev. - standard deviation, Min. - minimum, Max. - maximum, CV - coefficient of variation). The seedling development was monitored in the first and second year in the Rimski Sancevi fruit tree nursery, Novi Sad, Serbia. In the agro-ecological conditions of the nursery, monitoring of the one- and two-year-old Turkish hazel seedling growth indicators demonstrated that one-year-old plants were not viable rootstocks. However, two-year-old seedlings, based on the development of the root neck and the achieved plant height, showed potential for grafting hazel on Turkish hazel rootstocks. Hazel cultivar grafting was performed on two-year-old Turkish hazel seedlings by tongue grafting method. The results indicated excellent compatibility and grafting success rate. 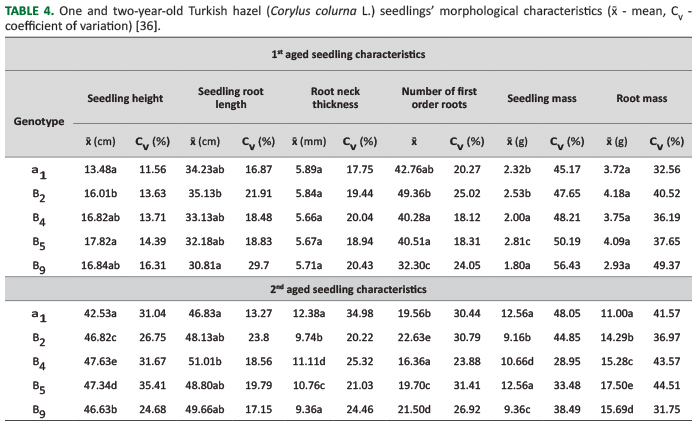 Measurements of one and two years-old seedlings’ height, as well as root length and other characteristics are shown in Table 4 . TABLE 4.One and two-year-old Turkish hazel (Corylus colurna L.) seedlings’ morphological characteristics (x̄ - mean, CV - coefficient of variation) . There are significant differences in seed quality from seeds collected from different locations in Turkey (Table 4). The size and weight of Turkish hazel nuts depend on the respective harvest year . The altitude is rather unlikely because all stands, where seeds were harvested in Turkey, were located at an altitude of approximately 1000 m above sea level. However, low temperatures at the beginning of the vegetation period had a considerable influence demonstrating a negative effect on the size and quality of the nuts . The number of seeds per kilogram was 549 to 1049 pieces. Of these, 172 to 489 seeds were viable . TABLE 5.The number of seeds per kg and seed origin. Various attempts of certification at the laboratory of Bavarian Office for Forest Seeding and Planting have shown that a stratification of at least 120 days is promising . The best results have been obtained by previous research [36, 47] with autumn seeding (64%) and stratification of 120 days (14.2%). It is only by the treatment with gibberellic acid, which promotes germination, and an interruption of the germination, that the results are clearly better. Another method is to attack the pericarp prior to sowing. According to Jansky et al. , it improves the germination rates to 30%. In contrast, 14% of the nuts germinated with intact pericarp. When the seed shell was removed, a complete laboratory germination was carried out . At an early start of germination, the seed can be stored at least -3°C until sowing . Turkish hazel has an early vegetation activity; thus it should be planted before the end of March. Shoot activity depends on the location and weather in spring. The dipping of seedlings in protectant against evaporation is recommended. On intensive grassy surfaces, stronger ranges should be selected with height from 50 to 80 cm or 80 to 120 cm, especially in spring plantings . Because of intensive root formation, the seedlings should not be older than two years during planting . Sufficient moisture for roots before and during the planting is necessary for the success of the application [16, 37]. If necessary, a proper root cut can be performed. Natural regeneration is also possible in older stands. Turkish hazel can also be introduced by autumn seeding [2, 36]. These protect the seeds against late frost as well as against high-growth and darkening weed growth in the growth cover . The selection of suitable stands, where the seeds can be collected, plays a crucial role for the main tree species (native tree species) of each country in Europe. Although most stands of the main tree species in Germany (e.g. beech, spruce, fir, oak) are naturally regenerated, the classification of the origin areas for the plant material is restricted, and subject to legal requirements (e.g. EG-Law:1999/105/EG, German-Law 2003. FoVG-Forstliches Vermehrungsgutgesetz). The individual areas of origin were selected in accordance with natural growth conditions. In order to take account of these growth conditions of stands and therewith associated phenotypic and genotypic properties, origin areas should be identified. The provenances should have the characteristic name and a description of the forest locations. The recommended origins may only be replaced by the compensation origin if the seed supply cannot be ensured. In contrast, the non-native tree species, as alternative tree species, are not well known and examined, and the selection of the plant material is more or less random. In most cases, when plants were offered by forestry nurseries in Europe, the origin and quality of the seed, seedlings and saplings were undescribed and unknown. To protect all forest ecosystems as well as the services and goods that forests provide from potential future climate change, mixed forests should be composed. All alternative tree species (e.g. Turkish hazel, cedar) which are discussed in some European countries such as France or Germany for mixing, should be examined. For future adaptation during climate change, the populations where seed will be collected should contain high genetic diversity, higher growth rates and better wood quality. So far, there has been limited knowledge on the genetic diversity of C. colurna in the remaining populations of the natural distribution area. The initial studies were done by Šeho et al. and showed clear differences between provenances from the Balkan Peninsula and Turkey. However, Ayan et. al. state that due to relatively narrow genetic distances among populations and their scattered distribution in the natural distribution areas, conservation programmes should integrate improvement, on the one hand to preserve in-situ populations, while on the other hand selected materials can be preserved ex-situ as progeny or clonal archives and seed orchards [3, 20]. Genetic conservation of Turkish hazel should play a key role in future sustainable forest development in all countries where this species is distributed (e.g. Turkey, Bulgaria, Romania, Serbia, Bosnia, and Georgia). It can be used under changing climate conditions as a native tree species to stabilize labile forest stands [3, 20, 31-33, 49, 50]. The question of the origin was not further discussed, but it certainly plays a decisive role in silviculture and has a major economic impact. In the case of Douglas fir (Pseudotsuga menziesii (Mirb.) Franco), the most important non-native tree species in Central Europe, this sequence was observed in the form of contamination by fungi and significant differences in growth performance. As for black pine (Pinus nigra J.F. Arnold), there were clear differences in growth between the individual herds [51, 52]. These differences, which are seen in introduced tree species in Germany, can probably be seen in the imported Turkish hazel. Especially those tree species which have a very widespread area (east-west) and occur in the coastal area as well as inland, have adapted to the prevailing growth conditions. The phenotypic and genotypic properties that characterize these populations should therefore be examined in detail to identify the appropriate origins for Germany and Turkey. A systematic establishing of provenance tests can play a major role for the assessment of individual origins. At the same time, environmental conditions, as well as possible locations, should be covered. These trees are already well-adapted to difficult environ-mental conditions. In the countries where this species occurs naturally, the required propagation material should not be imported from other countries. The plant material should be grown in domestic nurseries of the related country. State forests organisation should be responsible for the production of plants. Seedlings should be planted in small populations (e.g. Konjic, Afyon, Tismana). Furthermore, these seed stands can be included and protected as an in-situ gene conservation unit. If it is not possible to protect these populations, the forest sector of each county should prepare a concept for ex-situ gene conservation. From a scientific point of view, there should be at least 20 mother trees chosen for seed collection [53, 54]. For the wild cherry (Prunus avium L.) at least 25 mother trees are recommended . Especially, for insect-pollinated tree species the pollen exchange is intensive between neighbour trees. This effect called “actual neighbourhood size” is for the service tree (Sorbus torminalis (L.) Crantz) counts six trees, but the distance among trees can be in some cases up to 2.5 km . The distance between trees that can be used for seed collection should be at least 20 m [54, 57]. In this way, sufficient genetic variation of the seed and plant material will be ensured, and can be used to establish seed orchards. The regular and straight stem forms of this tree seems to be interesting from the technological point of view. The detected variation in terms of nut quality could be an added value for the species, as well as for its use in plantations and the agroforestry system. No adequate information is available on C. colurna, thus the present paper has to be considered as a first step to widening the knowledge on the genetic, ecological, economic and cultural potential of the species as a multiservice supplier. In the view of that, the set of data produced gives useful information to start genetic improvement programmes aimed to extend the planted productive area and cultivation systems. The extension of the potential area where C. colurna can be planted should be preliminarily detected according the delimitation of the ecological niche where the species can find suitable conditions . Future research should focus on two types of assisted migration. The first AM should focus within the current range of the species or within modest range extensions with the aim to sustain forest productivity and health under climate change and increase the genetic diversity [58-61]. This practice has already been implemented for other tree species in several regions, and can be adapted for Turkish hazel. The second type of AM is outside of the natural distribution range of species (e.g. Turkish hazel provenances transfer to Germany). This activity should supplement the spectrum of the existing tree species in Germany and at the same time conserve it from extinctions under climate change [ 33, 58]. The authors would like to thank Assist. Prof. Dr. Ferhat Kara, Kastamonu University, Faculty of Forestry, in Turkey for language editing. GHIMEEY L 1980 Corylus colurna as valuable reserve tree species in Hungary. Erdö 29: 365-369. Jansky A, Hartmann W, Stoesser R 1988 Untersuchungen zur Keimung der Baumhasel. Deutsche Baumschule, 1988 - agris.fao.org. ŠEHO M 2013 Schwarzkiefer und Douglasie: Wachstum und phänotypische Eigenschaften verschiedener Proveniezen: ein Beitrag zum Potential fremdländischer Baumarten als Ersatzbaumarten im Klimawandel, 157 p.
ISAAC-RENTON MG, ROBERTS DR, HAMANN A, SPIECKER A 2014 Douglas-fir plantations in Europe: a retrospective test of assisted migration to address climate change. Glob Change Biol 20 (8): 2607-2617. DOI: https://doi.org/1111/gcb.12604 . LEECH SM, ALMUEDO PL, O’NEILL G 2011 Assisted Migration: adapting forest management to a changing climate. BC Journal of Ecosystems and Management 12 (3): 18-34. © 2019 by the Croatian Forest Research Institute. This is an Open Access paper distributed under the terms of the Creative Commons Attribution License (http://creativecommons.org/licenses/by/4.0).